For 100 years, most decisions about the U.S. electric grid have been made at the top by electric utilities, public regulators, and grid operators. That era has ended. Small-scale solar has provided one-fifth of new power plant capacity in each of the last four quarters, and over 10 percent in the past five years. One in 5 new California customers of the nation’s largest residential solar company are adding energy storage to their solar arrays. Economic defection––when electricity customers produce most of their own electricity––is not only possible, but rapidly becoming cost-effective. As the flow of power on the grid has shifted one-way to two-way, so has the power to shape the electric grid’s future. Legacy, baseload power plants are becoming financially inferior to clean energy competitors. Electricity sales have stagnated as customers reduce use and produce electricity for themselves. Communities are reaping greater economic rewards from power generation, as electric customers, individually and collectively, produce more locally. Almost no utility or utility regulator is adequately planning for this fundamental shift. Dozens of utilities across the country have proposed new gas-powered generation that has little chance of remaining online through the end of its economic life due to stiff competition from solar-plus-storage. Some have been approved despite substantial gaps in the economic analysis. Utilities have damaged their reputations by resisting customer interest in distributed energy resources, sending lobbyists to preempt or curtail policies that reward customer-sited and customer-owned power generation. Utility investments in large-scale renewable energy have addressed environmental concerns, but these low-cost power purchases have not delivered reduce electricity prices for end users nor assuaged the interest in over 70 cities of reaching 100% renewable electricity more rapidly. Utilities have deployed utility-owned distributed energy resources, but in ways that withhold much of the economic or financial benefit from customers. Regulators and state legislators cannot expect incumbent utilities to respond adequately because the rise of economical solar-plus-storage challenges the century-old assumption of a natural electricity distribution monopoly. Instead, electricity market rules should facilitate fair compensation for distributed energy resources and market participants where technology already allows them to compete. This report details recommendations for changing utility oversight and modifying electricity markets to transition from the dying utility distribution monopoly to a vibrant, democratic energy system where customers have the opportunity to choose distributed energy options that benefit themselves and the greater grid. Utilities don’t have time to prepare for a future with economical, distributed energy storage because it’s on the doorstep. In 2016, the first hints of a storage-driven transformation of the electricity business came as a “postcard from the future” in Hawaii. Sunrun offered their Brightbox, a combination solar-plus-battery product with a price of 19 cents per kWh, almost 50 percent cheaper than grid electricity. Sunrun began offering its Brightbox service in California in December 2016. By 2018, 1 in 5 new residential Sunrun solar customers in California were choosing to add storage. These early adopter states just scratch the surface of the competitive landscape. ILSR’s analysis isn’t alone. According to McKinsey, within three years an Arizona electric customer would be able to serve 80 to 90% of their electricity needs with solar and battery storage, at a lower price than by buying electricity from the utility company. Storage prices have fallen remarkably fast, as illustrated by the remarkable price declinesfor battery storage technology in the last three years (measured in the cost of energy averaged over the expected life of the battery). Customers have responded to the falling costs, with a surge in new installations of residential energy storage in the past year. Although few residential customers would find it practical, full grid defection––or cutting the cord to the grid—could be at price parity within 10 years. Business customers managing larger facilities have it even better. A 2017 analysis of solar and storage for affordable housing facilities in Chicago found that adding energy storage reduces the payback for solar from 20 years to 6 years by helping manage facility demand charges. A broader report, also from 2017, suggests that commercial storage (alone) could be economic for one in four commercial electricity customers nationwide. Many commercial electricity customers have a demand charge, a portion of the electric bill based on a one-hour window of peak energy use each month, and representing half of many businesses’ bills.3 Solar energy alone is insufficient to avoid this charge, but a relatively small battery can lower that peak. 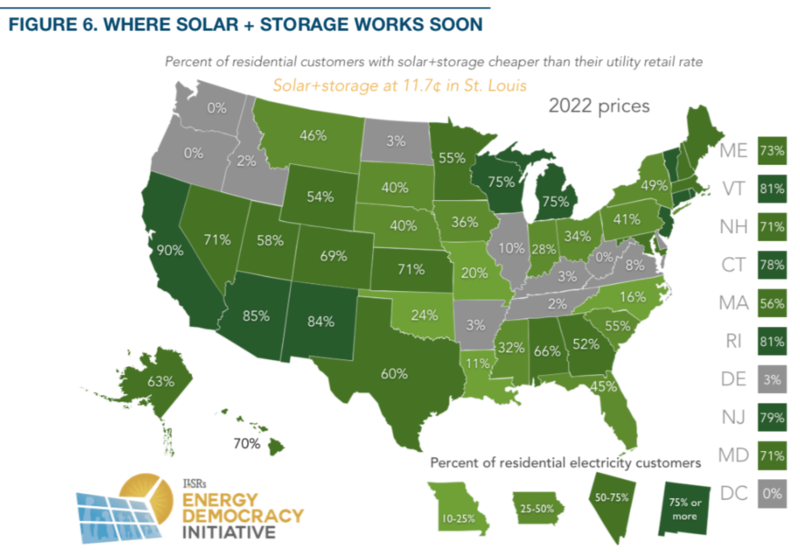 The following map from the report shows particularly robust opportunity in the Southwest (coinciding with excellent solar resources), but also in the Upper Midwest, West Virginia, and much of New England. The prospects for solar+storage are even more remarkable in the near future. The following chart shows forecast steep declines in battery costs––by half in the next five years, and by two-thirds by 2030. 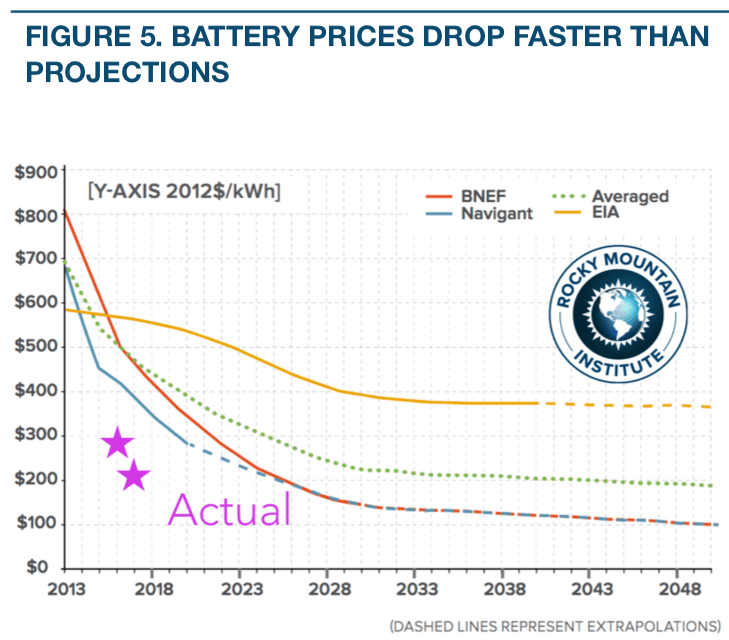 Batteries aren’t just getting cheaper, they’re doing so at a rate far outstripping predictions. 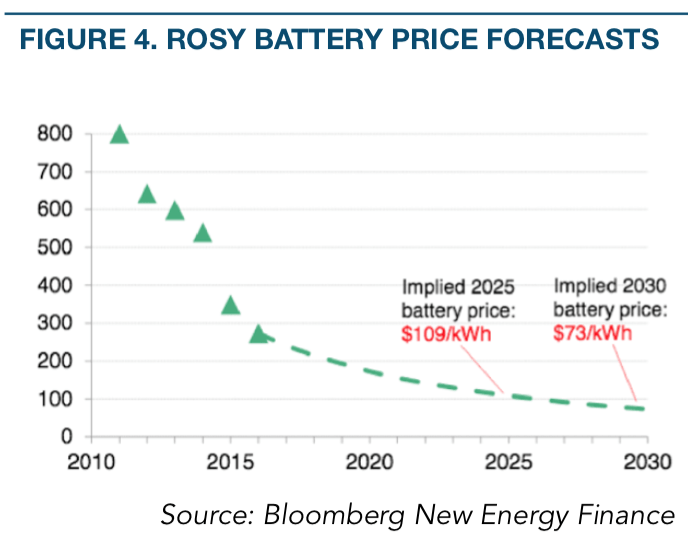 A 2014 report from Rocky Mountain Institute featured several battery price projections, including one from Bloomberg. At the time, Bloomberg projected batteries crossing the $300 per kilowatt-hour threshold in 2022. Three years later, Bloomberg showed that batteries reached that price point in 2016; by 2017, battery pack prices had fallen another 30%. 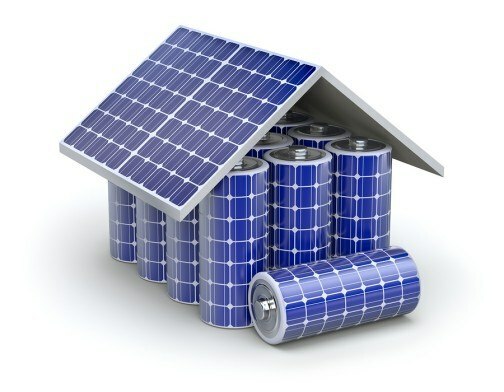 How do rapidly falling costs change the calculus of solar plus storage? If the Powerwall cost forecast by GreenTech Media comes true––halving the cost––and solar continues a modest 3-4% reduction in the cost per year, in 2022 nearly half of all residential electricity customers (in all but 4 states) will be able to get electricity as affordably from their rooftop and a battery than from the utility company.4 The following map provides a stunning contrast to the one based on today’s prices (page 3). 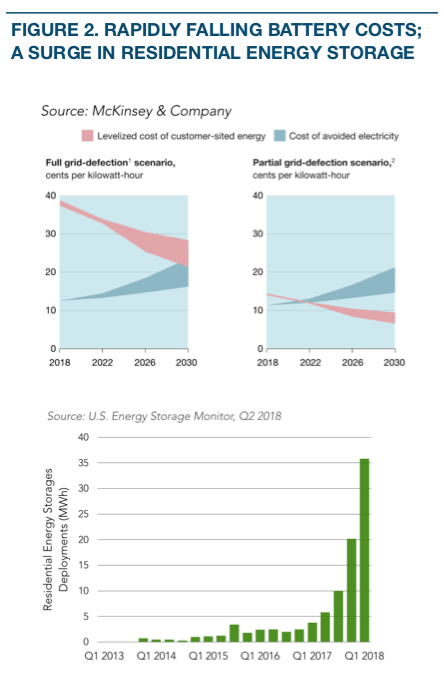 Storage costs and forecasts are a clear warning to utilities that customers will be able to leverage batteries (and solar) for much more control of their energy bills than ever before. Energy storage increases the value of rooftop solar installations to customers––providing resiliency to utility outages and allowing them to avoid new utility fees. It’s no wonder that, as noted earlier, 1 in 5 Sunrun solar customers in California opted for storage in 2017. In the U.S. Mid-Atlantic region, the grid operator PJM requested such “ancillary services” that included markets for frequency and voltage regulation markets for smaller producers (a minimum size of 100 kilowatts). The lucrative prices––$40 to 50 per megawatt-hour––and low threshold for participation supported development of dozens of energy storage projects. Several hundred megawatts of battery storage entered the PJM market in response to the opportunity, many doing double-duty by providing crucial services to their owners, not just the grid. Changes in market rules and reduced costs for gas competitors have since reduced the financial opportunity in the Mid-Atlantic, but batteries can still provide value to their customers and the grid in other ways. 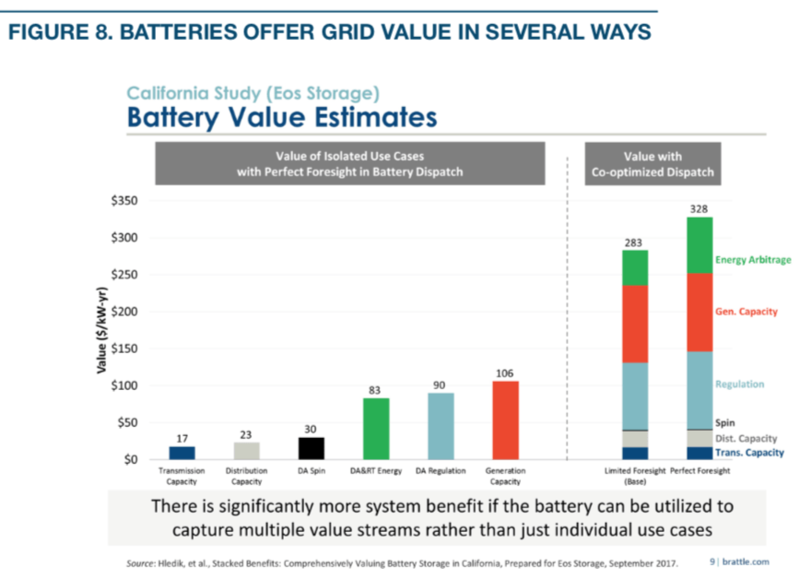 A study for the California market showed no fewer than six value streams for battery operators aiding the grid, as illustrated below. The first two bars represent the value of additional capacity freed up on the transmission and distributed system by storing excess local energy. The third bar is the ability to provide reserve energy on a moment’s notice, and the fourth represents the value of actually delivering that energy. The fifth bar shows the value of helping regulate the grid’s voltage and frequency to keep it stable. The final bar represents the reduced need for power generation capacity that can be supplied by storage. In addition to the Mid-Atlantic and California examples, markets are likely to open in other regions soon. A 2017 directive from the Federal Energy Regulatory Commission requires all grid operators to adopt rules recognizing the many values of energy storage and allowing firms to aggregate many small storage projects into large ones. If customer-sited distributed energy resources can access the financial compensation for their value, customers will likely take opportunities to reduce their energy costs through greater self-reliance. The implication for utilities is clear: be wary of making substantial, centralized infrastructure investments when decentralized technology has significant advantages, can be online sooner, with decisions made by folks outside your boardroom. The following section explores the implications of the competition from distributed energy resources. Locally generated power from solar-plus-storage can undercut the century old utility model––centralized power plants sending electricity long distances over high voltage transmission lines––in three ways. First, it has higher value. 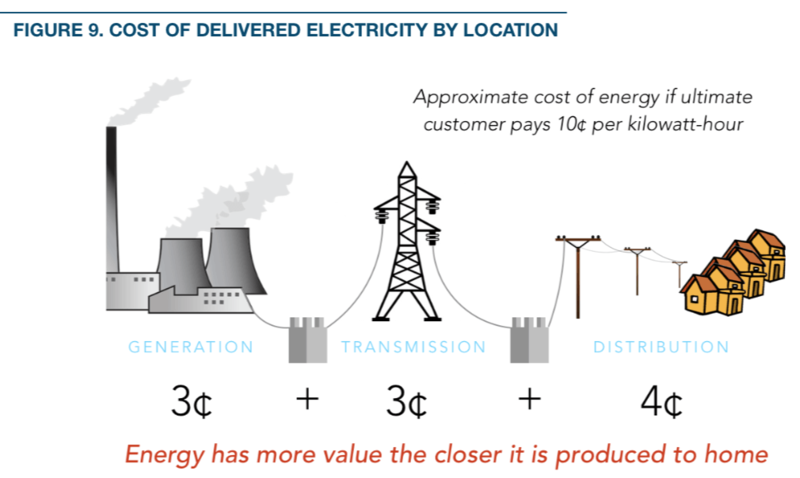 If the cost of delivering electricity to the ultimate customer is 10 cents per kilowatt-hour, a typical utility’s costs are split between generation (about 3 cents), transmission (about 3 cents), and distribution (about 4 cents). Power produced at the power plant is worth far less than energy delivered into the customer’s home or business. The following graphic offers an approximation of the typical utility’s cost structure for delivered electricity. Second, distributed energy resources can be deployed more quickly, in months rather than years, and the price often decreases in the time it takes to plan and finance a centralized power plant. Third and most striking, the decision to deploy distributed resources is relatively independent of centralized power plant development. Utilities don’t do distribution planning and customers don’t consult utilities when installed distributed energy resources, despite clear effects on one another. California provides a powerful illustration of how the combination of thousands of individual actions presents the collective triple threat. Over 700,000 solar arrays in California were installed because of simple economics––rooftop energy generation from sunshine costs customers less than utility power and customers and third party marketers were given a chance to access that value. Most of these arrays were built in the last 10 years, less than a typical utility’s 15-year resource plan and in much less than the average power plant lifespan (40 years or more). Unused to competition or planning on such a short timescale, California utilities were caught flat-footed. The economics of coal and nuclear power plants have for years relied on operating at high capacities around the clock. But with energy efficiency and distributed energy lowering demand; utility-scale solar and wind cutting into sales with cheaper, cleaner electricity; and now, with the advent of energy storage, these power plants struggle to compete. Utilities operating non-competitive plants in Ohioand Illinois have sought subsidies to keep these “baseload” plants operating. Some power companies have even lobbied the federal government to provide a backdoor subsidy by rewarding power plants with on-site fuel storage (a backhanded swipe at wind and solar that could misfire as these systems add battery storage). The competitive threat also applies to new power plants, where the rapidly falling costs of distributed energy make slow-to-build, long-term investments very risky. The Diablo Canyon nuclear power plant, in San Luis Obispo County, Calif., is a prime example of threat to incumbent power plants and the potential for innovative solutions. Unfortunately, the settlement agreement was undercut by an early-2018 order from the Public Utilities Commission. Commissioners removed community transition funds (focused on replacing lost property tax revenue) and employee retention; instead, the state legislature has taken up these issues. The Commission order also deferred the replacement power decision to the utility’s next resource planning process. It’s an illustration of how siloed decision-making in the electricity business makes it hard to plan for an orderly retirement of legacy power plants. The following map provides some indication that this case study is more than a California problem for legacy power plant owners. It shows the cost of a 100% electricity supply overlaid with nuclear power plants Bloomberg has identified as having marginal economics.6 In today’s grid, with significant reserves of on-demand power plant capacity, solar and wind can entirely replace a retiring baseload power plant like Diablo Canyon. 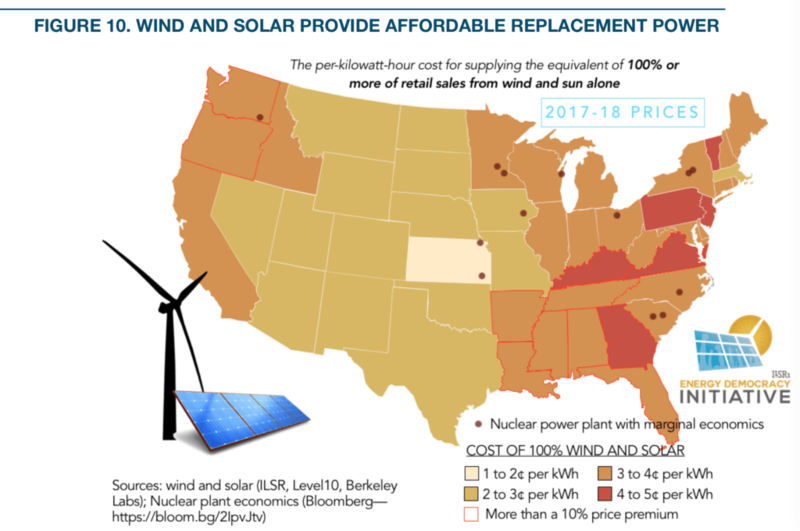 The stunning result is that renewable replacement power is very low priced, at 3 to 4 cents per kilowatt hour or lower, in every state with a nuclear power plant operating on the margins. Replacement power from new renewables is likely cheaper than most existing generation in all but eleven states (bordered in red).7 Even in those states, the difference is less than a penny per kilowatt-hour. As the grid shifts toward renewables, wind and solar energy alone won’t suffice to provide round-the-clock supply. But as subsequent sections of this report reveal, the past and future cost declines for storage make renewables a potent threat to existing (and planned) centralized power plants. In 2015, NRG Energy asked California state regulators to certify the need for a new 262-megawatt gas power plant in response to a request from Southern California Edison. The Johnson City, Calif., combustion turbine “peaking” power plant was meant to replace existing capacity from power plants that could no longer comply with new state water use rules. By early 2018, it looked like the power plant proposal was dead. What happened in those three years? In short, a dramatic drop in the cost of storage. Even at the time of its proposal, the Johnson City gas plant was up against low-cost renewable energy, as was the Diablo Canyon nuclear plant. 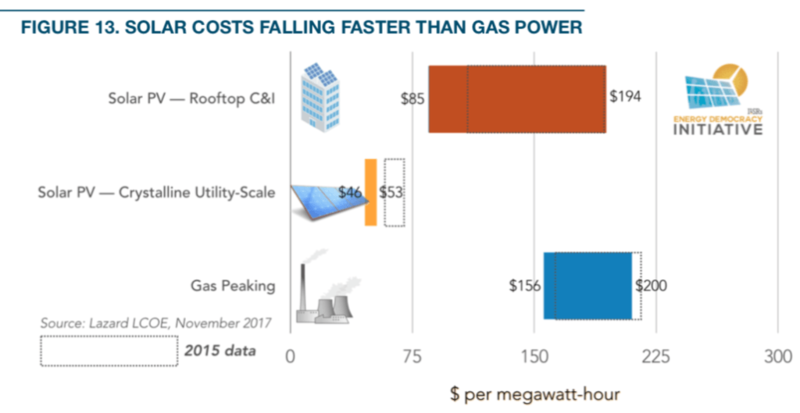 This chart, from the 2015 annual cost of energy analysis by investment bank Lazard, shows that solar PV was much cheaper than a gas peaking plant like the one proposed by NRG. Peaking plants run infrequently but are used to fill in power supply during periods of high demand. Even rooftop scale projects were competitive with the proposed peaker on a cost of energy basis, but utility-scale solar electricity was half as expensive. Lower costs for both solar and storage contributed to Greentech Media’s results. In its 3rd quarter 2017 report, the Solar Energy Industries Association reported utility-scale solar costs of $1.10 per Watt or less, and costs for non-residential solar (think large rooftops) of $1.55 per Watt. The cost of solar has been falling and falling faster than the cost of gas-produced electricity. A 2017 update to the Lazard cost-of-energy illustrates. Energy storage is also relatively inexpensive and becoming even more so. 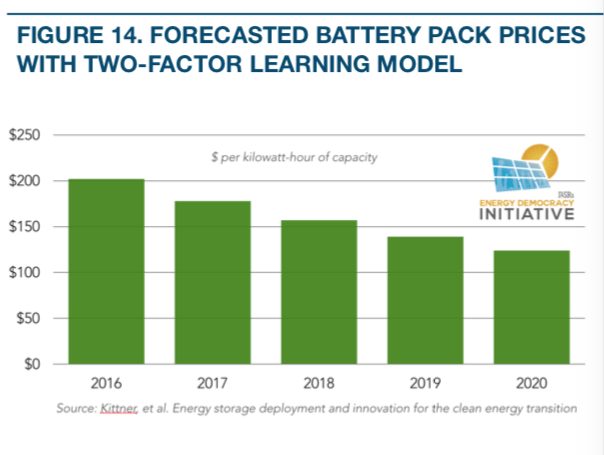 In a late 2017 update, a Bloomberg analysis priced battery packs at $209 per kilowatt-hour, less than half as expensive as the CAISO model for the Johnson City Plant. A new study published in Nature by professors from University of California Berkeley lent more fuel to the fire, skewering prior battery price forecasts as too conservative and suggesting that by 2018 battery packs would already be inexpensive enough––well under $175 per kilowatt-hour––to affordably supplant the Johnson City gas plant. 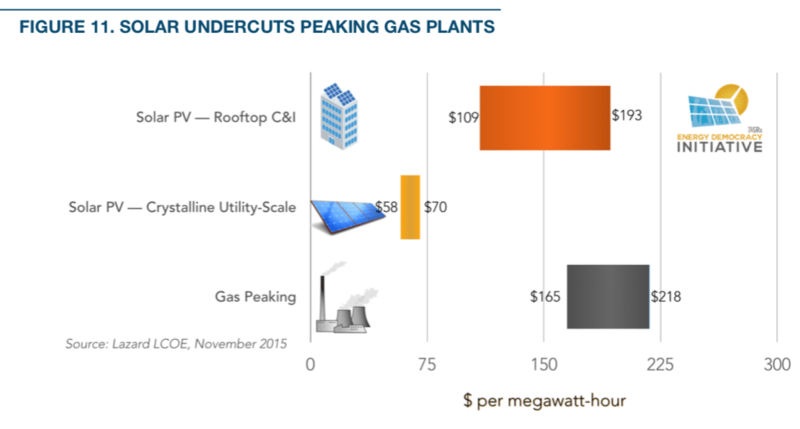 The prices below indicate the upfront cost per kilowatt-hour of capacity. Given the new data, in October 2017, CAISO recommended a new request for proposals to allow for renewable energy and storage to bid in at more current prices. NRG has suspended its application for the plant. In just the latest example, First Solar Inc. won a power contract to supply Arizona’s biggest utility when electricity demand on its system typically peaks, between 3 p.m. and 8 p.m. The panel maker beat out bids from even power plants burning cheap gas by proposing to build a 65-megawatt solar farm that will, in turn, feed a 50-megawatt battery system. Johnson City may also hint at problems for recently built gas power plants. Over 5 gigawatts of gas peakers were recently deployed in states that have, or will have soon, economical competition from solar and energy storage. 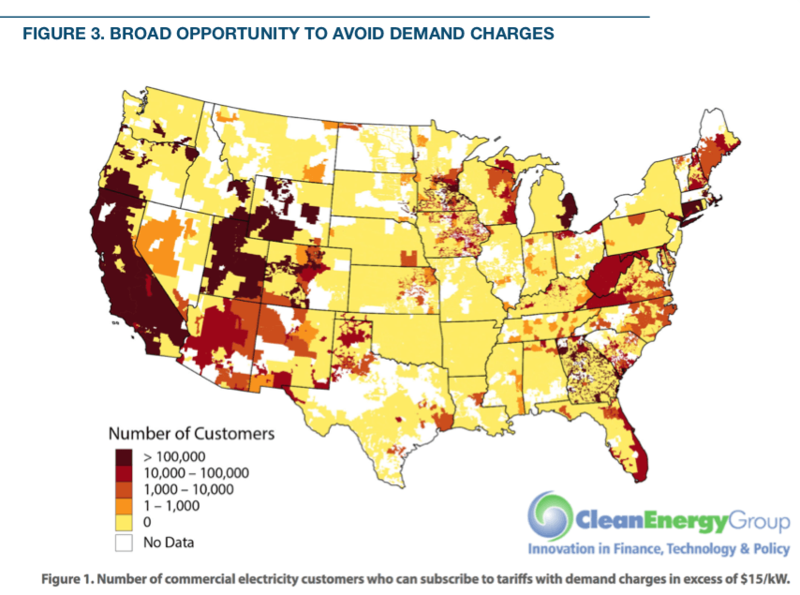 Customers in California, Nevada, Arizona, and New Mexico can already access solar and storage combinations competitive with utility power prices. 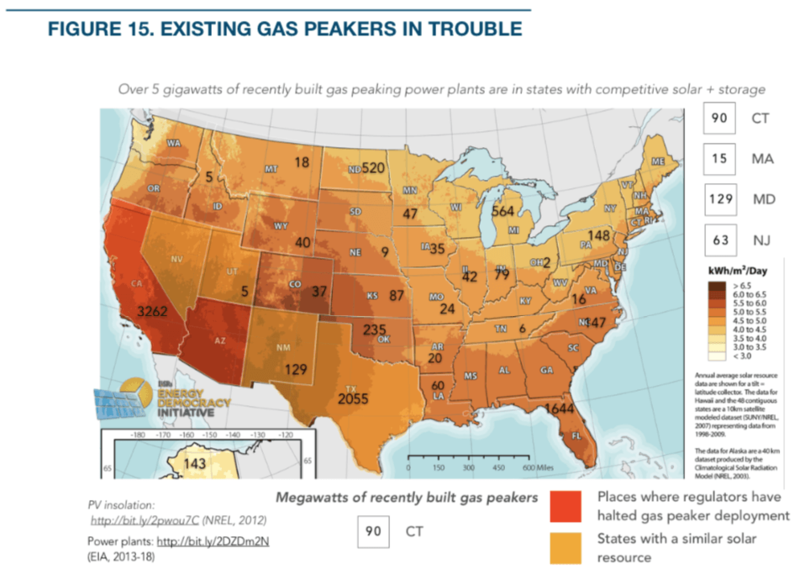 Regulators in two of these states, California and Arizona, have recently slowed or halted gas peaker deployment in response to these cost-competitive threats from distributed and centralized renewable energy plus storage. The long timeframe for planning, constructing, and operating large-scale power plants doesn’t do the industry any favors. The Johnson City, Calif., plant wouldn’t have started producing electricity until 2022 and would have saddled electric customers with expenses for 40 years. Alternatives––including distributed solar, demand response, and energy storage––can be constructed in a much shorter timeframe (months, instead of years), and have been getting cheaper every year. Competition from distributed energy may also sharply reduce sales. High electricity prices drove nearly 20% of Hawaiian Electric customers to install solar arrays by late 2017. With help from public regulators, the utilities won a reduction in compensation for rooftop solar producers. But within months, third parties started offering island customers combination solar and energy storage packages capable of providing electricity cheaper than the utility offered. With competitive solar plus storage, Hawaiian electricity companies could be reluctantly mailing “postcards from the future” about the financial challenges of accommodating customers with less expensive options. If just 2 in 10 Hawaiian residential and commercial electricity customers exercised their choice and had solar plus storage (either by retrofitting a battery onto their existing solar or buying a bundled system) it could cause a net reduction in Hawaiian Electric Company electricity sales of nearly 950 gigawatt-hours per year, or just over 10% of total sales. At today’s electricity prices (and ignoring many other benefits of avoiding oil-based power generation) it would cost the company over $250 million per year in lost revenue (about 11% of total revenue and more than the utility’s $167 million net income for 2017). Distributed solar and storage not only undercut the economics of centralized utility power plants, they can boost local economies in ways utility-built power plants don’t. The failed Puente gas plant provides a powerful example. The proposed gas peaker would have supplied 271 megawatts of peak power for an upfront cost of $250 million dollars (and millions more for fuel consumed). The cost of energy from the plant would have been above $150 per megawatt-hour, with at least half of that energy cost leaving the community to pay for imported fuel. ILSR modeled distributed solar and storage replacement options for the Puente gas plant and found a solar and storage hybrid with a higher upfront cost but much lower lifetime cost, and substantial local economic benefits. The key element is replacing the peak energy supply from the proposed Puente plant. 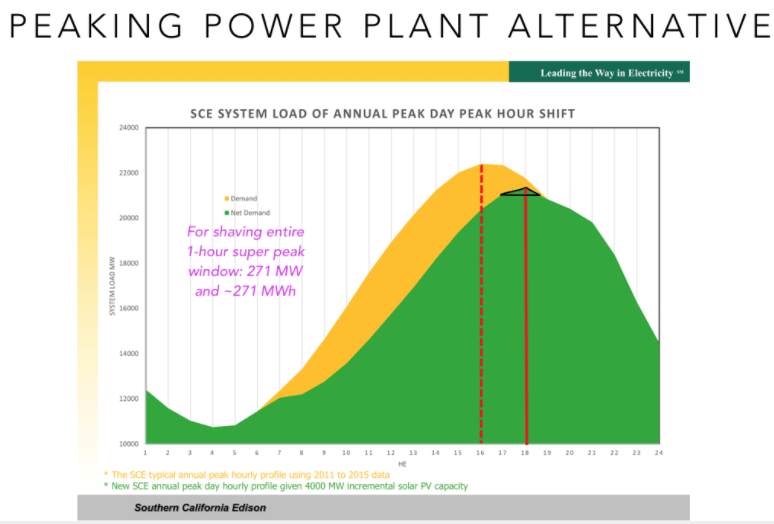 To understand what is needed, the following chart from Southern California Edison illustrates their peak energy demand on a summer afternoon, shown below in green. The tiny black triangle shows the area, up to 271 megawatts, at the peak of the curve, that the Puente gas project would likely have fulfilled. 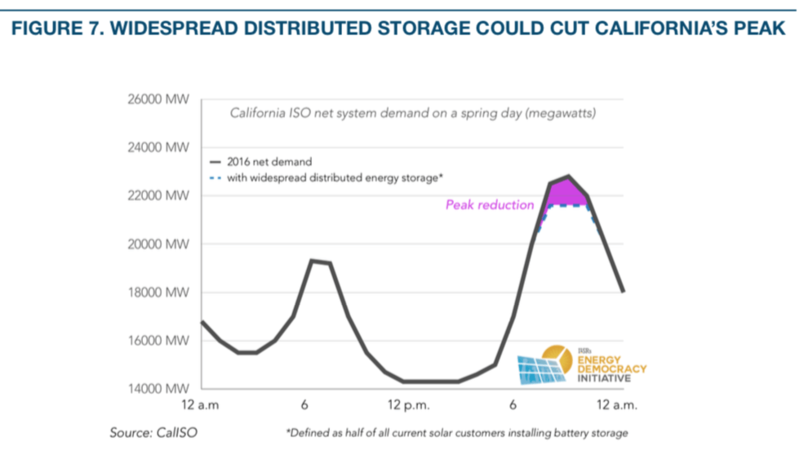 ILSR modeled three, combined strategies to meet the 271-megawatt peak: demand reduction, solar energy, and battery storage. We assumed there were sufficient opportunities to reduced energy demand by about 11 megawatts, equivalent to 4% of the Puente capacity. This is based on ILSR’s research on peak demand opportunity and is certainly conservative (this model only factors in residential demand response, despite commercial demand response opportunities being much larger). Demand reduction was priced at $300 per kilowatt, based on California utility demand response programs. Of the remaining 260 megawatts of capacity, solar energy can only fulfill 30 megawatts of the peak energy use during the peak hours, because south-facing panels have limited production at that time of day. So, we modeled the installation of 292 megawatts of solar using the low sun angle to provide 30 megawatts of peak-time power as well as 230 megawatts of solar energy that could be stored for later use. ILSR assumed a split of 80% non-residential solar arrays and 20% residential solar, with a weighted average solar installed cost of $1.88 per Watt ($1.60 per Watt non-residential, $3.00 per Watt residential). The total cost for this distributed solar power plant is about $550 million. The final piece for this modeled scenario is 230 megawatts of battery storage, assumed to cost $175 per kWh, for a total cost of approximately $40 million. Given the favorable economics under California’s “Net Metering 2.0,” it’s assumed that energy storage is co-located with all non-residential solar projects (about 64 megawatts). 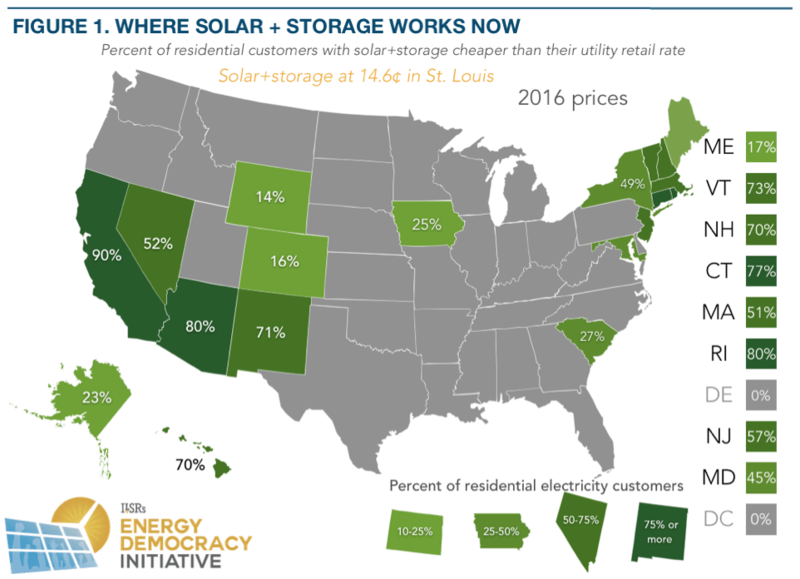 If half of residential solar customers also opted for storage (e.g. a Tesla Powerwall), it would account for a further 11 megawatts of storage. Former US President Barack Obama went to his ancestral home in Kogelo Village, Kenya. Obama’s grandmother lives in Kogelo where he danced at the opening of a youth center launched by his half-sister Auma Obama’s Sauti Kuu Foundation. Obama’s first stoop in Africa was Johannesburg to give the 2018 Nelson Mandela Annual Lecture in partnership with the multi-billion dollar Motsepe Foundation. Obama’s benefactor, Dr. Patrice Motsepe is the founder and chairman of African Rainbow Minerals and worth billions. Celebrity Net Worth reports that both Barack and Michelle Obama’s net worth as $40 million. Both are examples of the up-and-coming contemporary African Diaspora. Send money back to Africa. The African Union (AU) continental union consisting of all 55 countries on the African continent, The African Diaspora are people who were enslaved and shipped to the Americas via the Atlantic slave trade between the 16th and 19th centuries, with their largest populations in Brazil, the United States and Haiti. The AU defines the African Diaspora as consisting: “of people of African origin living outside the continent, irrespective of their citizenship and nationality and who are willing to contribute to the development of the continent”. Its AU declares to “invite and encourage the full participation of the African Diaspora as an important part of our continent, in the building of the African Union”. Those that view Africans and African Americans as “victims” should look closely to learn of a new benefactor with keen entrepreneurial sensibilities, who has managed to accumulate billions of dollars’ worth in savings, which has strong cultural ties to the ancestral homeland? Africa’s Diaspora accumulated an estimated US$53 billion in savings every year. Large numbers of Diaspora Blacks live and work iin and among higher-income countries. Most diaspora members’ incomes are modest by the standards of rich nations, and their savings might seem meager in the world of development funding collectively they can add up to staggering amounts of money. Worldwide, African Diaspora members have accumulated an estimated US$53 billion in savings annually, including more than US$30 billion saved by people from sub-Saharan Africa. The development potential for Africa’s Diaspora is about “more than remittances,“ “human capital” of knowledge and expertise gained while working abroad. The World Bank and other development partners revealed that the total money transfers by African migrants to their region or country of origin surged to $35.2 billion, in 2015. Blacks of the Diaspora share values, interests and heritage. The Diaspora’s Blacks could all get rich by connecting and working together. Links between the African Diaspora and African development are already happening. Diaspora members already invest in real estate, entrepreneurial businesses, and capital markets. Sometimes they pool their money with friends or form an investment consortium. Dr. Arikana Chihombori-Quao, a Ghanaian national, is the Permanent Representative of the African Union Representational Mission to the United States of America. She recently invited the Deputy Chairperson of the African Union Commission, Quartey Thomas Kwesi to Washington to discuss next steps for implementing the African Continental Free Trade Agreement (CFTA). The African Continental Free Trade Agreement (CFTA) is a noteworthy achievement. A groundbreaking achievement in African diplomacy, trade, and economic development the CFTA has the potential to cover 1.2 billion people and over $4 trillion in combined consumer and business spending opens up the continent to new investors and better opportunities for its entrepreneurs. Intra-African trade is expected to skyrocket, and with it, industry and manufacturing. At the same time, the agreement introduces opportunities to re-approach existing trade relationships, like the African Growth and Opportunity Act (AGOA), to make trade more beneficial for all. Despite the drop, overall investment remains stable, with wind and other clean energy technologies picking up the slack. New data from Bloomberg New Energy Finance shows a 19 percent reduction in solar financing in the first half of 2018, compared to the same period last year. Continued declines in project costs, along with a policy shakeup in China, drove the drop. BNEF expects the ramifications from both to build in the second half of the year. But where investment in solar faltered, other clean energy technologies made up the difference. Wind saw a particularly sharp 33 percent increase in investment over the first half of 2017, rising to a total of $57.2 billion. While lower relative to previous years, solar investments still outperformed wind so far this year at $71.6 billion. Overall, clean energy investment dropped just 1 percent and totaled $138.2 billion in the first half of 2018. China, the globe’s No. 1 investor in clean energy, contributed to much of the drop in solar investment. The country’s solar funding fell 29 percent between the first half of 2017 and the first half of 2018. In June, the government announced it would not approve any more subsidized utility-scale PV projects in 2018. The change, effective immediately, means projects connected past June 1 will not receive any feed-in tariffs from the government, constricting growth in a country that’s become the world’s leader. The changes will lead to a precipitous drop in demand and a condition of module oversupply, feeding a further downward price spiral. GTM Research expects Chinese PV demand to drop this year to 28.8 gigawatts from a past projection of 48.2 gigawatts. Between 2018 and 2022, demand will fall to 141 gigawatts from the previous projection of 206 gigawatts. It’s a significant contrast to last year, in which BNEF notes China set a “spectacular” record by installing 53 gigawatts. Outside of China, the country’s policy changes will push module prices lower than already expected. BNEF now projects a 34 percent decrease in module prices, to a global average of 24.4 cents per watt. GTM Research analysts are slightly more conservative, projecting a 31 percent drop from the fourth quarter of 2017 to a global average of 27 cents per watt in the fourth quarter of 2018. The extreme shift in China also has analysts at BNEF suggesting that 2018 could be the year that global solar installations fall for the first time. The full impact of the policy change, announced just one month ago, won’t be clear until later in the year. Looking ahead, GTM Research analysts expect there to be an upside to steadily falling module prices. After 2020 they’ll unlock additional global demand as solar edges closer to or achieves grid parity in some regions. The countries most able to take advantage of the pricing changes are those where module prices make up a significant portion of a project’s capital expenditures. In India, where modules currently account for 57 percent of project cost, the price drops capex by 17 percent. Meanwhile, spectacular investment growth in other sectors could outshine solar entirely. In the U.S., for instance, investment in wind grew 121 percent between the first half of 2017 and the first half of 2018. Investment in the U.S. wind sector is expected to increase further as developers scramble to meet the federal Production Tax Credit deadline. In China, wind investment rose as well, although by a smaller 4 percent. Overall, wind investment in the two countries came out nearly equal: $17.5 billion in the U.S. and $17.6 billion in China. Investment in “energy smart technologies,” a category that encompasses products such as battery storage and electric vehicles, grew 64 percent. Rising electricity demand could lead to sustained absolute growth of 80 terawatt-hours per year, according to the U.S. Department of Energy’s National Renewable Energy Laboratory. Utilities have struggled with flat demand for years, but analysis by the National Renewable Energy Laboratory predicts steady growth across the next three decades — largely driven by the adoption of electric vehicles. The study considers three scenarios, a reference case and medium- and high-adoption electrification predictions. All indicate demand growth, but in the medium and high scenarios for 2050, U.S. electricity consumption increases by 20% and 38%, respectively, compared to business as usual. Utilities could go from stagnant demand to compound annual growth rates of 1.6%, which would amount to sustained absolute growth of 80 terawatt-hours per year. “This unprecedented absolute growth in annual electricity consumption can significantly alter supply-side infrastructure development requirements,” the report says. Study results should hearten utilities, particularly as the electric vehicle industry has gotten off to a relatively slow start in the United States. But EVs are widely expected to catch on, and there could be 7 million of them on the roads by 2025 — up from 567,000 at the end of 2016, according to estimates from the Edison Electric Institute and the Institute for Electric Innovation. “Although we extensively and qualitatively discuss the potential drivers and barriers behind electric technology adoption in the report, much more work is needed to quantitatively understand these factors,” Mai said in a statement. However, utilities have largely bought into the dream. “Electric vehicles are the biggest opportunity we see right now,” Energy Impact Partners CEO Hans Kobler told Utility Dive. And the impact could go beyond just higher kilowattt-hour sales. Among the report’s other findings, an NREL analysis notes that electrification could “dramatically shift load shapes,” with electric heat pumps for winter space and water heating needs playing a significant role. Shifts in peak demand “could have significant impacts on electric utility planning, grid operations, reliability assessments, and electricity markets,” NREL concluded. States in the Northeast or Midwest will see the greatest changes in peak demand. The impacts of load growth on peak demand are a vital issue for utilities. While demand management can help flatten some of the demand spikes, utilities will need to upgrade their distribution systems. Earlier this year, the California Energy Commission released an analysis of what infrastructure was necessary to reach the state’s EV goals, and concluded EV chargers could add 1 GW of peak demand to the grid. In 2016, electricity’s share of final energy consumption in the United States was 19%. 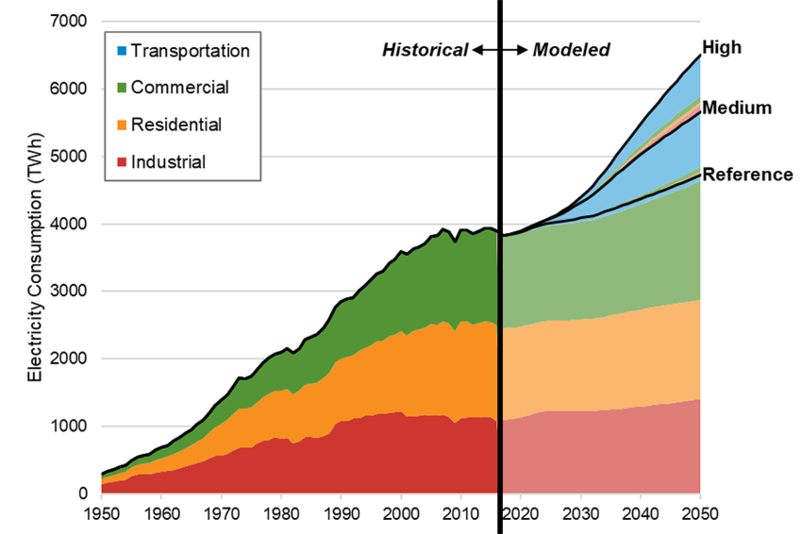 Driven largely by the transportation sector, NREL believes electricity’s share of total final energy consumption will grow to 32% in the medium and 41% in the high scenario by 2050. The 45-participant second round of the 51st State Solar Co-op has issued a request for proposals (RFP) from area solar installers. Installers interested in serving the group are encouraged to download the RFP and response template. All bids are due on Thursday, July 26th by 5:00pm. Residents of District of Columbia who are interested in joining the co-op can sign up at the co-op web page. The Co-op is open to all residents of DC, regardless of income. As a DOEE-funded Solar For All project, the co-op is focused on expanding access to solar for low income households. Low to moderate income households may qualify for Solar for All grant funding from DOEE that Solar United Neighbors is administering to cover the cost of solar arrays. For qualifying households, the solar array paid for by Solar United Neighbor’s Solar for All grant could reduce your electric bills by 50% over the course of a year. Please visit the co-op web page to see if you might qualify. Please spread the word to your friends and family in the District about this opportunity to go solar with a co-op! If you have any questions, please don’t hesitate to contact us at dcteam@solarunitedneighbors.org. Installers can contact Yesenia Rivera with questions regarding the co-op RFP. Blockchain can help reduce costs in rooftop solar, electric vehicles, and other energy applications, according to a report to be released July 18. Blockchain ledgers that manage transactions securely could help some parts of the energy sector reduce risks and costs, according to the report from the nonprofit analysis and research organization Energy Futures Initiative. Blockchain also may help the sector manage the rapid changes it is facing due to the need to greatly reduce greenhouse gases and keep the electric grid reliable, said the report. “The fact that energy, which is always slow to innovate, is thinking about blockchain— we’re really excited about that,” Alex Kizer, lead author of report and director of strategic research at the Energy Futures Initiative, told Bloomberg Environment. EFI, founded a year ago by former Obama administration Energy Secretary Ernest Moniz, gave an early copy of the report to Bloomberg Environment. Blockchain is a secure electronic ledger system where transactions are recorded chronologically. It forms the foundation of cryptocurrencies such as bitcoin, and can verify tiny transactions between energy users and track how much electricity is generated by rooftop solar panels and other energy sources. Blockchain can manage large volumes of transactions quickly, securely, and at a relatively low cost, the report said. The ledger system also dramatically reduces overhead costs of using intermediaries, such as clearinghouses, to enable leaner, more profitable businesses, the report said. But Kevin Kelly, an equity strategy associate at Bloomberg Intelligence, questioned some of the cost-saving assertions in the report, although he agreed that blockchain can reduce transaction times. “Blockchain technology in its current state is actually fairly expensive to implement, let alone maintain,” Kelly told Bloomberg Environment in an email. The cryptocurrency behind Blockchain, known as bitcoin, is very energy intensive, but the report points to other less energy intensive, alternative cryptography that could be used. The report said $100 million to $300 million has been invested in 100 energy-sector blockchain applications, with at least 60 energy blockchain-focused startups forming globally in the last few years. One area where blockchain is used is in distributed energy, mainly rooftop solar, where peer-to-peer energy markets are forming. In these markets, a consumer can directly purchase energy, such as solar or wind, from a supplier. Brooklyn Microgrid is doing just that. The $6 million project uses blockchain to manage and automate transactions between 60 producers, including households with solar rooftops, that sell energy to 500 households with smart meters. The technology also can help with billing and payments for charging electric vehicles. “We see that charging infrastructures are still going to be a big barrier, and blockchain can help out with that,” Kizer said. 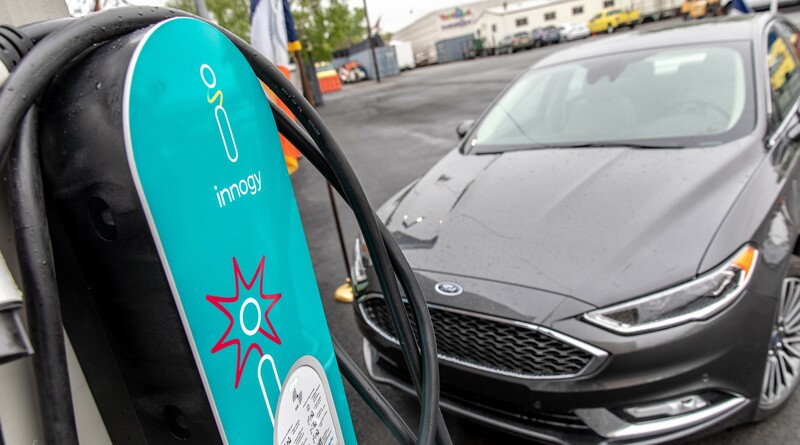 For example, the European energy company Innogy SE has launched more than 1,200 electric vehicle charging stations supported by blockchain. The report also covered the benefits and challenges of using blockchain in energy trading platforms, energy transactions for emerging markets, and emissions trading systems for greenhouse gases. Kizer said that blockchain would also be particularly beneficial to carbon registries, because some of the limitations around them dealing with foreign markets are often difficult to verify. “That’s something where really the core benefits of blockchain get really to the heart of some of the frictions in the carbon registries markets,” he said. Blockchain could provide credibility in the exchange of information about carbon inventories and registries around the world, and could create a transparent record for the market data, the report said. How can utilities prepare for the approaching electric vehicle boom? Mass electric vehicle (EV) adoption is coming to the U.S., and preparing resilient infrastructure for millions of electron-dependent vehicles is something we need to think about right away. The writing is on the wall. General Motors, Ford Motor Company, and Fiat Chrysler Automobiles are all making big commitments to EVs, as are BMW, Daimler and the Volkswagen Group. Such a wide range of manufacturers vying for market share means that current high-end, high-profile EVs like Tesla’s Model S will be the tip of a growing iceberg in the U.S. As more affordable EVs hit the road, a luxury goods market will transform into a mass market, where vehicles. The U.S. Big 3 and most of the European auto companies have said that they’ll make good on their EV promises between 2021 and 2023. This means utilities and cities only have five years at most to start rolling out the sort of charging infrastructure that a U.S. EV boom will require. And we’re not just talking about the top cities and biggest utilities in the United States. Second- and even third-tier cities will be no more immune to EVs than they were to the rise of the internal combustion engine. If forecasts prove true, as many as 2.9 million EVs could be on the road within five years. So as a utility or local municipality, how can you best prepare? The first thought for a city or regional planner, fuel company or utility is simply to site charging facilities at existing gas stations. However, not only does this option ignore the changing face of driving and the unique needs of EV owners, it misses a number of highly lucrative commercial opportunities and new business models. The right solution needs to offer extended parking for a large number of electric vehicles – which take anywhere from 30 minutes to 20 hours to charge. It would also have to be strategically placed near (but not in) key business districts – some of which may soon impose vehicle toll schemes, like New York or Seattle. Let’s go even further than simply a car park with EV charging facilities. Instead, let’s build Mobility Hubs where EV charging is just part of a wider consumer benefit. Imagine hubs where office workers drop off the car along with their laundry or maybe even their kids for daycare. Drivers could grab a coffee, dine in a restaurant, or work out at the gym in the same place they charge their EV. Place Mobility Hubs just outside city limits, and offer bike and electric scooter hire points for the short final hop to the office. The number of business opportunities and community benefits would stack up quickly, including the potential rejuvenation of previously neglected areas and utilization of unused plots of land such as old parking lots and garages. 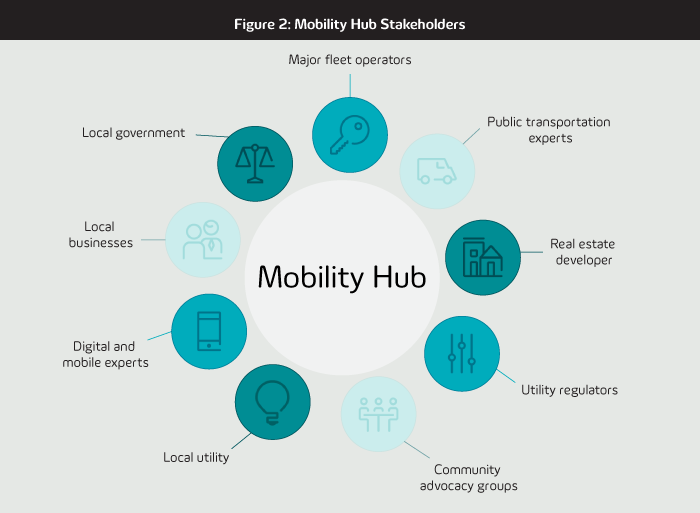 Mobility Hubs would engage local communities and build partnerships with small local businesses – far more beneficial than an existing parking garage or a gas station. Convene thinkers and doers from city governance and planning, utilities and other interested stakeholders, including big fleet operators such as the U.S. Postal Service, UPS, DHL, plus mass transit authorities and taxi operators, Uber and Lyft. Next, hash out the ownership of and responsibilities for operations, any concessions arrangements, financing and community engagement issues – and, perhaps most important of all, grid stability, power supply and payment processing. Finally, set a realistic timeline with detailed goals and key milestones. The good news for utilities and cities is that many jurisdictions are already taking the first steps in planning for a robust infrastructure that will serve this coming wave of EVs. Legislative clarity is a necessary first step on this journey. The state of Pennsylvania is at the forefront by proposing rules governing third party electric vehicle charging. Specifically, a draft policy stipulates that EV charging is not considered reselling electricity, and electric distribution companies should add EV charging to their base rates – which is great news for the utility business. My company, innogy consulting, is playing its part in helping organizations navigate these turbulent and exciting developments. We’ve been named finalist in the NYCx Climate Action Challenge, which asked the commercial sector to propose a city-wide solution to a future without gas-powered vehicles in New York City. Our solution for NYC includes Level 2 chargers retrofitted on light poles, a mobility app connecting customers with the nearest charging infrastructure, and an initial five Mobility Hubs offering everything from integration with public transport to EV valet parking, Wi-Fi connectivity and local business deals. The plan’s five-year rollout would begin ahead of 2020. In recent weeks, we’ve seen initiatives announced in such diverse cities as Raleigh, NC and Sacramento, CA. Mobility Hubs can help these cities fulfil their vision of electric mobility – perhaps we can help your organization do the same. innogy consulting is an energy-focused management consulting firm with operations in North America, Europe, and the Middle East. Our 200 consultants drive projects from restructuring to innovation, change management to market capitalization, for leading U.S. energy companies intent on fortifying their businesses for the future. To learn more, visit innogyconsult.com. (WASHINGTON, DC) – Today, Mayor Bowser and DC United announced a $25 million private clean energy financing deal for the installation of state-of-the-art energy and water efficiency measures, an 884 KW solar array, and stormwater retention systems at DC United’s 20,000-seat Audi Field soccer stadium. The measures are being funded through the Department of Energy and Environment’s Property Assessed Clean Energy (DC PACE) program, DC’s innovative green financing solution, which operates through a public-private partnership, allowing local lenders to fund environmentally beneficial projects at no cost to taxpayers. This deal, done through a relationship with locally-based EagleBank, marks the nation’s largest single PACE note issued to date, and the first issued for a stadium project. The hallmark of the deal is the planned installation of 884KW of building-integrated solar panels installed on the stadium’s canopy and throughout the site. This system, to be developed by DC-based New Columbia Solar, will provide roughly one million kilowatt hours of solar power annually, enough to offset almost a third of the stadium’s projected electricity usage. PACE will also fund high-efficiency heating and cooling systems, LED field lighting, additional building insulation, low-flow water fixtures, a green roof, and stormwater management measures that meet the District’s highest standards for protecting the Anacostia River. In total, the stadium’s PACE-funded measures will result in a 25 percent reduction in energy use and will reduce emissions by 820 metric tons of CO2 annually – roughly equivalent to taking 173 cars off the road. These reductions are critical components of Washington, DC’s ongoing efforts to achieve the Sustainable DC and Clean Energy DC goals, which call for reducing greenhouse gas emissions by 50 percent, increasing the use of renewable energy to 50 percent of the District’s energy supply, and reducing energy use by 50 percent by 2032. In addition, through green roofs, bioretention areas, and infiltration basins, the site will provide storage for more than 55,000 cubic feet of stormwater onsite. Since taking office, Mayor Bowser has made clear her commitment to reducing greenhouse gas emissions and increasing access to clean energy in all eight wards. In less than two years, the DC PACE program has grown exponentially, resulting in a total of $30 million in private capital for projects across multiple sectors in the city including small businesses, affordable multifamily housing, a charter school, and a community-based Ward 8 nonprofit. To date, PACE investments across seven projects are resulting in a total reduction of 1,533 metric tons of CO2 annually. Dear MEDSIS Stakeholder, We recently circulated the MEDSIS Technical Conference Meeting Minutes for your review. If you did not receive the email containing the attachment of the minutes, please reach out to us directly. Thank you for your participation in last month’s MEDSIS Techncial Conference on June 27th, 2018. For those who attended the conference, SEPA has captured the information you provided in the two breakout sessions. We are not seeking commentary or input in addition to what has already been discussed. We are looking for your approval of the accuracy of your statements and comments detailed in the report. If we mistakenly captured your input within the meeting minutes, we’d like you to respond with the line number of the comment in question with any edits you may have. We are asking for your comments by July 18th at 12:00pm (est). We are excited to collect input and deliver the meeting minutes to the Commission, moving forward into Phase 2 of MEDSIS (Working Group Process). Please look for a follow-up email regarding the working group selection and registration process and stay updated on www.DCGridMod.org. Ultracapacitor modules are installed in standard 19” rack systems combined with a communications gateway providing two-way communication for state of availability and state of health via Modbus TCP/IP or Process Field Net (Profinet) protocols. A lack of transparency and reliance on bilateral deals could mean corporations are leaving money on the table. Prices for renewable energy are coming down, and the number of renewable corporate power purchases is going up. Those trends should be working in concert for the benefit of corporate power purchasers, but it is hard to know if corporate buyers are getting the full benefit of the low prices because of a lack of visibility into the pricing of corporate power purchase agreements (PPAs). Regulated utilities do not divulge all the details of PPAs with private companies, but they have to file rates that give an indication of pricing levels in broad terms. Corporations are under no such obligations and usually do not divulge pricing for competitive reasons. “For a developer to get the price down takes work; it is not just taking less profit. “Jon Summerville Project Manager, Burns & McDonnell Often, corporations looking for renewable PPAs will work in a one-to-one relationship with the renewable energy developer. That puts pricing on a cost-plus basis, Jon Summerville, project manager at construction and consulting firm Burns & McDonnell, told Utility Dive. Those contracts are easier to negotiate than a competitive process, but they usually yield a higher price, he said. One firm that’s working to bring lower prices to corporate PPAs by increasing contract transparency through their web-based marketplace is LevelTen, a wholesale energy consulting group. Using cost-plus contracts could mean “a lot of money is being left on the table,” Summerville said. Enel Green Power North America has contracted to sell 84 MW of the output of its 300 MW Diamond Vista wind farm in Kansas to TCEC, 100 MW to City Utilities of Springfield and 100 MW to the large manufacturer Kohler. Summerville declined to reveal the exact number, but said the TCEC wind PPA price was “much cheaper” than the $23.76/MWh solar PPA signed by NV Energy in Nevada in June. NV Energy had filed for approval of a 300 MW solar PPA for 25 years at a rate that beat the lowest-cost solar contract in the nation. Prices for renewable PPAs have been declining in general. In January, Xcel Energy received a median bid price of $21/MWh for wind-plus-storage projects and $36/MWh for solar-plus-storage projects, beating the $45/MWh price for a solar-plus-storage project hit last year in a PPA between Tucson Electric Power and NextEra Energy. “For a developer to get the price down takes work; it is not just taking less profit,” Summerville said. The key, he said, is a competitive procurement process followed by several rounds of negotiations. “Often, it is the very last step that gets the results,” Summerville said. That was the case with the TCEC deal. One final phone call dropped the price by $1.10/MWh, Summerville said. In the end, the final price was $4.45/MWh less than the first price received in the competitive solicitation, which translated into $1.6 million in annual savings from the original price over the life of the 20 year contract. Declining prices for renewable energy are enabling “quite a bit of demand in all parts of the country, not only from utilities, but from corporate and industrial purchasers, as well,” John Hensley, senior director of industry data and analysis at the American Wind Energy Association (AWEA), told Utility Dive. “The first quarter of this year was the most active we’ve seen since we started tracking corporate PPAs in 2013,” comprising about one-third of all PPAs signed, Hensley said. 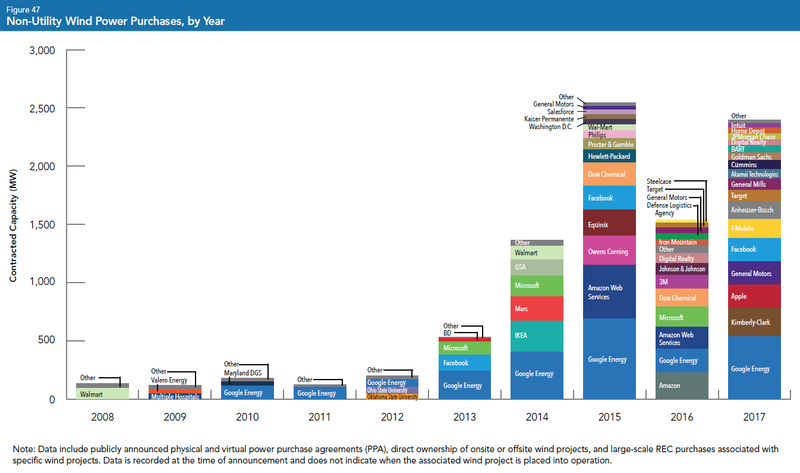 AWEA expects between 8 GW and 13 GW of wind power capacity will be deployed on an annual basis between now and 2020. The rush of corporate PPAs has prompted AWEA to release a Corporate Buyers Guide to Wind Energy. “Every C&I customer has a unique business situation and set of needs and interests that inform how they make a purchase,” Hannah Hunt, deputy director of electricity policy and demand at AWEA, told Utility Dive via email. The guide will “help new buyers explore the options available to custom tailor their purchase of wind energy from a specific wind project,” she said. Breakfast and Lunch Provided . The Industrial Hemp Program outlined in the current Senate Farm Bill could upend the separate-but-unequal funding model of the past. But only if legislators make it so. Today, in a second vote, the House passed its messy version of the farm bill. As this legislative skirmish gobbles up the headlines, remember that the Senate quietly passed its own version out of committee earlier this month—one that includes a plan to legalize hemp production. If adopted, that plan would allocate funding for schools that want to conduct hemp research. With this new money, legislators could make huge progress in undoing more than a hundred years of inequality in the way land-grant universities are funded. But it’s not there yet. As written, the Industrial Hemp Program doesn’t specify which schools can qualify for research funding. With a few strokes of the pen, however, legislators could make a tiny change to reserve that money for land-grant universities, a change that would be largely invisible to a casual observer. But for Historically Black Colleges and Universities (HBCUs), it could provide crucial support for chronically underfunded research programs. Through this pilot, there’s a real opportunity to start leveling the playing field for HBCUs that have had to jump through hoops since the 1890s to get the same funding their predominantly white counterparts receive automatically. Photographed above is a hemp research plot at the University of Kentucky, a land-grant institution. Quick history lesson: In 1862, Abraham Lincoln signed the Morrill Act, effectively creating the land-grant institution system overnight. These schools were meant to stimulate innovation in agricultural research and provide technical assistance to farmers. Those first institutions were given free land and guaranteed federal funding as long as their home states promised to match the federal support dollar-for-dollar. Most of them get automatic funding from their states every year.In 1890, the federal government created 19 HBCU land-grant institutions. These institutions were given money—not land—to establish their presence. Just like the 1862 institutions, they are required to get half their funding from sources other than the federal government. But unlike the 1862 schools, their home states aren’t required to comply with the dollar-for-dollar federal match. What often happens instead is that HBCUs have to come up with the 50-percent match themselves, while nearby 1862 universities receive guaranteed annual federal and state funding automatically. It may seem like a small difference, but the end result is a large disparity in funding for HBCUs. Lincoln University in Missouri, for instance, has to move money around in its own budget to meet the 50-percent federal matching requirement, which it often falls short of. Between 2000 and 2017, Lincoln University received $103 million in federal funding. By contrast, just 31 miles down the road, another land-grant university—the University of Missouri-Columbia—received $234 million from the state in 2017 alone. The Industrial Hemp Program may be promising for HBCUs in desperate need of research dollars. The federal government has repeatedly recognized that funding disparities in land-grant universities are a problem. In March of this year, the Senate approved a 14-percent, one-year funding increase for all HBCUs to help cover costs. And the “Equity in Education Land-Grant Status Act of 1994,” Section 7402 of the Senate’s farm bill, appropriates funding and research support specifically for land-grant tribal colleges and universities with no match requirement. The government could easily add HBCUs to this provision and preserve the 14-percent increase in perpetuity.State hemp programs have already begun to close the funding gap in agricultural research at land-grant universities. Of the 37 states that have passed laws regarding industrial hemp, 12 are home to HBCUs and Native institutions classified as land-grant schools. Most states with hemp laws have established pilot programs that include funding for university research. Some states have gone so far as to make sure that research money is designated for land-grant universities. In North Carolina, for example, the hemp law specifically states that research will be conducted in partnership with North Carolina State University and North Carolina A&T University, which is a HBCU. And Florida cited the University of Florida and Florida A&M University, also a HBCU, as its primary research stations. Lawmakers have the opportunity to reserve research funding for land-grant universities, providing crucial support for historically underfunded schools. These universities have used state-sponsored hemp research funds to spark innovation and cultivate strategic partnerships in the hemp and medical marijuana industries. The University of Maryland-Eastern Shore, a HBCU that recently won a case against the state over equitable funding, has conducted on-farm medical marijuana research. It has also launched, in its School of Pharmacy, an introductory class on the use of medical marijuana, in partnership with a local doctor who owns a dispensary. Maryland has even established the Eastern Shore Innovation Center, a co-working laboratory where paying tenants work on product development for medical marijuana.Kansas and Oklahoma passed their hemp pilot programs in April and included research funding for institutions like Langston University, a HBCU in Oklahoma, and Haskell Indian Nation University in Kansas. Unlike some of the other states, however, Oklahoma is allocatingresearch dollars to any college or university with a minimum soil science curriculum, reducing the amount of funding open to Langston University, an institution created specifically for agricultural research. The Industrial Hemp Program outlined in the current Senate Farm Bill would take precedence over existing state programs, leaving an opening for research funding to follow in the same separate-but-unequal model of the past. But the Senate has the opportunity to reserve the research funding for land-grant universities, providing crucial support for historically underfunded schools. Growing hemp can be a lucrative path for HBCUs and farmers of color. However, legislators continue to neglect the need to ensure equity in HBCU funding in the new farm bill. 1. Where can I obtain help with paying my heating and electric bills? who need help with paying their winter heating and/or yearly electric bills. income eligibility requirements, contact OHEP. Fund once every 12 months. may suggest additional places for you to contact. 3. How do I contact OER? 0474, option #3 then press #1or call (410) 767-8028, press #1. 4. My gas and/or electric service has been turned off – what should I do? including the income eligibility requirements, contact OHEP. from Fuel Fund once every 12 months. As part of the VW settlement, Electrify America and its partner SemaConnect are taking applications, first-come, first-served, for grants that cover installation, purchase and maintenance of charging in Multi-family housing (condos, apartments, townhouses, etc) and Workplaces, in the Washington DC area. In other words, a turn-key solution enabling EV and PHEV drivers to charge successfully at home and work. The “Charging Pyramid”. Cars spend most of their lives parked at home. or call SemaConnect directly at 800-663-5633. Joseph or Jesus will assist you determining the next step in the application process. Remember that VW wants to find multifamily and workplace charging sites. They are required to to find appropriate sites and spend their money as part of the diesel settlement. This is a great opportunity to address the vital need for multifamily and workplace charging in the Washington DC area! Take advantage of it!